NUSA DUA, BALI, INDONESIA, October 16, 2018 /EINPresswire.com/ — Enhanced your meeting experience at The Ritz-Carlton, Bali with the resort’s new offering: Tri Hita Karana, based on three fundamental philosophy of Balinese life. It is translates loosely as: harmony with God, harmony with humankind and harmony with nature making this award winning beachfront resort as the best meeting venue on the island. With its excellent meeting spaces, conference venue, superb location and innovative programs that harness the spirit of Bali and give guests a unique insight into traditional life on the island, this incentive program includes a Soul Purification Ritual, fun Team Building Activities and a fascinating Chefs Garden Tour and Cooking Class. The Balinese believe that maintaining the balance between spiritual and physical worlds is the key to wellbeing and prosperity. Channeling the notion of harmony with God, the traditional Soul Purification Ritual is led by a Balinese priest at sunrise and includes an offering of devotion, following by a ritual with holy water to cleanse the body, mind and soul. Herbs and spices play an important part in Balinese cuisine as well as traditional medicine, and guests can learn all about this in the Chef’s Garden Tour where they will collect ingredients for a casual and informative Balinese cooking class. The notion of community lies at the heart of Balinese heritage cuisine and traditionally a whole village will come together to prepare feasts for celebrations and holy days. Guests can enjoy this communal spirit as they create their own feast of classic Balinese dishes for lunch at the Culinary Cave. The aspect of harmony with humankind is also witnessed in the strong sense of community on the island and inspires the program’s enjoyable Team Building activities. 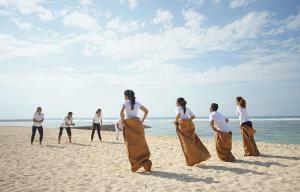 The resort’s secluded white sand beach is ideal for traditional games and low impact beach games like sack races, tug of war and marble and spoon races. “This inspiring new program has been thoughtfully created to reflect the valuable Balinese philosophy Tri Hita Karana and to motivate, enthuse and reward individuals and teams, ensuring your next incentive trip is a resounding success,” says General Manager Karim Tayach. 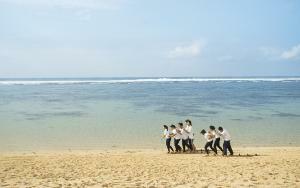 The Ritz-Carlton, Bali has launched new video of the Tri Hita Karana incentive program which can be viewed here. Located on a stunning beachfront combining with a dramatic clifftop setting, The Ritz-Carlton, Bali is a luxurious resort offering an elegant tropical ambience. Featuring tranquil views over the azure waters of the Indian Ocean the resort has 279 spacious suites and 34 expansive villas, providing the sheerest of contemporary Balinese luxury. Along the foreshore are The Ritz-Carlton Club®, six stylish dining venues, an indulgent and exotic marine-inspired Spa, and fun, recreational activities for children of all ages at Ritz Kids. A glamorous beachfront wedding chapel, makes an idyllic setting for destination weddings, while a range of outdoor event venues and extravagant spaces provide the perfect scene for celebratory events and wedding reception in Bali. Well-appointed conference venues, luxurious meeting spaces, customizable residential packages and experienced organizers also entice those looking to create inspired MICE Tourism events in Bali. Whether work, pleasure or romance is on the agenda, The Ritz-Carlton, Bali is the place to make memories that last a lifetime. Follow us on Facebook, Instagram, Twitter, Youtube, LinkedIn.